A new survey commissioned by Dell Inc. indicates that IT managers and the C-suite might be stronger partners than previously believed. 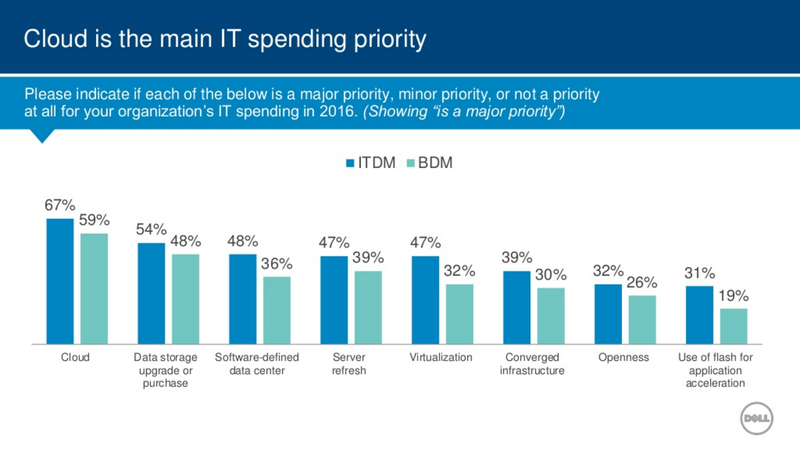 For example, according to the Dell State of IT Trends 2016 survey, both business and IT leaders agree that cloud technology should be the tech department’s number-one spending priority, followed by data storage upgrades and data centre investment. They also agree that IT decision-making should be guided first by increased productivity, followed closely by opportunities to grow the business. 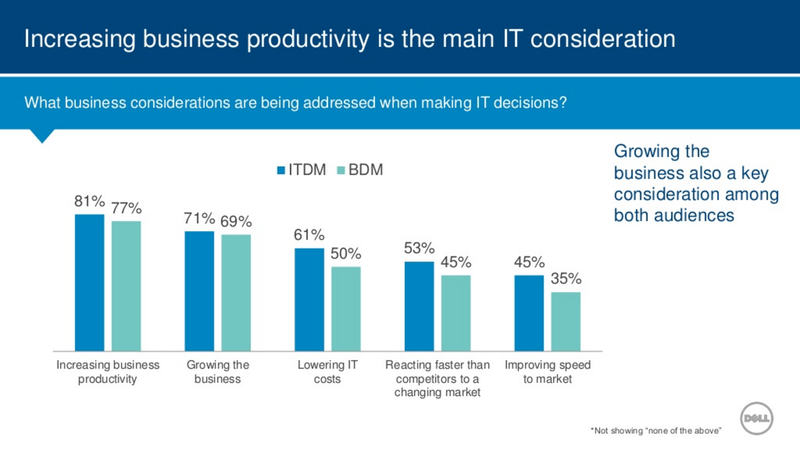 “While the original intent of this survey was not to specifically focus on the similarities and differences between IT and business decision makers, we found that there is an increasingly common understanding between the two groups, and more than perhaps it’s generally perceived to be,” Dell executive director of strategy and enterprise solutions Matt Baker wrote in a July 28 blog post discussing the study. “The results indicate that IT and business leadership are better collaborating on the same page about the latest in IT and how it can propel businesses forward,” he wrote. Dell commissioned research firm Penn Schoen Berland (PSB) to conduct the study, which consisted of online interviews with 700 IT decision makers and 500 business decision makers in seven countries (the U.S., U.K., Germany, Japan, Brazil, India, and China) between April 15 and May 4, 2016. More than 80 per cent of respondents said their company has considered moving its network, storage, CPU, and digital security to a software-defined data centre. The ability to quickly address issues is the top global concern regarding data centre management. Check out Dell’s executive summary of the survey below.